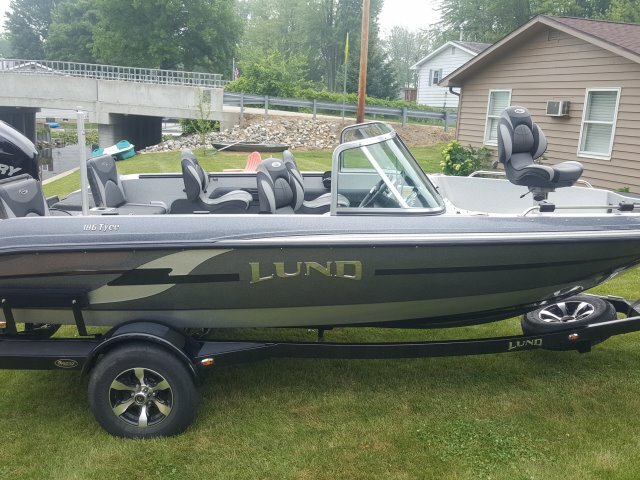 For Sale is a 2014 Lund Tyee 186 Fiberglass Fishing Boat equipped with Mercury 200hp Verado Supercharged 4 stroke outboard motor with power steering and mercury smartcraft system and gauges for trolling. This boat cost almost 60,000 new equipped this way. It also has a mount for a kicker motor, it has 2 live wells/ bait wells, fresh water wash down. The motor has 147 hours on it. Everything on the boat works as it should. The boat also has infinity sound system, 4 air ride chairs. The boat is rated for 8 people comes with ski pylon, cover and factory matched trailer. The boat is missing one “L” letter from the word LUND on the side which is raised lettering, I am working on getting that letter ordered. I can help you arrange financing with local banks or credit unions with approved credit, and 0 down around 6.95% interest rate for 120 months the payment would be 452 a month. This is just approximate, actual terms depend on credit. I am on lake wawasee, the boat is a fresh water boat.